Twitter is one of the most efficient media channels that can be used to capture people in the right moment of receptivity, and get in front of those who are interested in your products or services. Twitter’s robust targeting capabilities, when combined with a proper account structure, can help you meet or exceed your overall KPIs. In this article, we’ll discuss three tips to help you get organized with your Twitter ads account, and maximize overall performance. This has always been one of our primary recommendations, and having the proper account structure and campaign segmentation can significantly affect your overall performance. Keep in mind that the structure of your account is not completely permanent, and is likely to keep evolving over time. You can segment campaigns in many ways, after all, we all have different ways of doing things, right? That said, one of the most efficient methods is by segmenting campaigns by audience features, such as: Keywords; Followers; Interests; Tailored Audiences; TV Targeting; and event targeting. Though many users will get bucketed under more than one audience feature, meaning there might be some overlap between your audiences, Twitter’s internal algorithm is designed to maximize performance and will only select one ad from your account (the one with the highest quality score) to enter the auction. Scenario: Let’s say you are the owner of the fictitious company “AmazingShoes.com” which sells shoes to women, men, and kids of all ages, and your overall business goal is to drive positive ROI. You’ve noticed there’s a significant amount of traffic going through your fashion and sports landing pages, and there’s also a spike in traffic at night. This sample account is now fully segmented by audience feature at the campaign level, and we are enhancing our coverage with more granular information using Ad Groups. 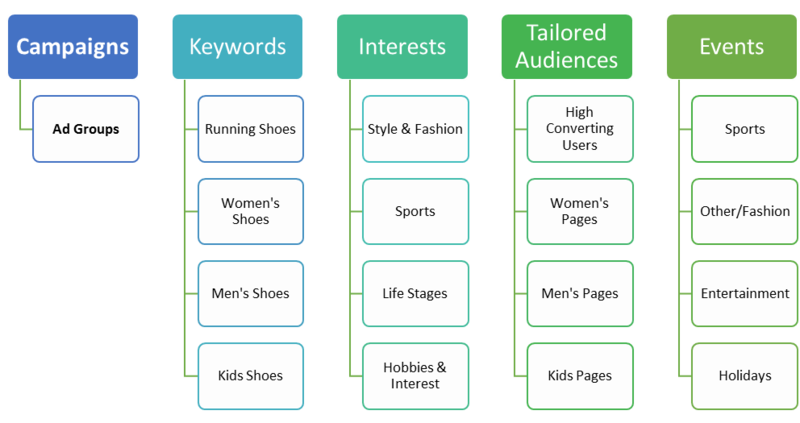 This type of structure gives us the ability to allocate budget levels across each campaign while also creating unique bidding strategies for each Ad Group. Keep in mind that the more information you have about your audience, performance data, etc., the more granular you can get with your targeting. Though there isn’t a perfect and magical recipe for structuring an account, and more than one strategy can prove successful, we have seen great success across campaigns that have been segmented by audience feature. Based on your business priorities or requirements and the size and scale of your campaign, any one, or combination, of these three structures may be most logical or work best for you. Introduced in August 2015, the Ads Editor tool allows advertisers to seamlessly create and edit numerous campaigns simultaneously using Excel with bulksheets. While the Ads Editor tool is not visually appealing, it is the most efficient way to create, edit and manage your Twitter campaigns at scale, as shown in Twitter’s Ad Editor overview video, embedded below. To get started with the Ads Editor, simply log into your Twitter Ads account and select “Ads Editor” from the tools menu. Before we get into lookalikes, we need to understand Tailored Audiences first. So, what are Tailored Audiences? Tailored Audiences are a targeting option that enables advertisers to use their own data to reach users, commonly known as remarketing or retargeting. Selecting "Exact URL" will trigger a conversion event whenever a user visits a page with the Twitter UWT that exactly matches your rules. Exact URL matching is case sensitive and looks to match the URL exactly as given, including any URL query string parameters. Since URL query string parameters can vary for some websites between users and site navigation paths, it is recommended that you only select "Exact URL" matching for specific use cases. "URL contains" will trigger a conversion event whenever a user visits any of your pages with a Twitter UWT that matches your rule. "URL contains" is case sensitive and checks if the website URL includes the specified text. This is the recommended method for identifying conversion events whenever it’s possible for your URL to vary between conversions (e.g. unique query string values can be included on the Thank You page URLs, etc.). Collect Your Mobile App Users: This is only applicable to advertisers with Apps. Once you have set up the mobile app conversion tracking (e.g. signs ups, micro-conversions), Twitter will automatically create tailored audiences from people that have completed these actions. We strongly recommend segmenting your tailored audiences as granular as you can, as this will allow you to have better control over your tailored and lookalike audiences. Now that we have covered what tailored audiences are and how to create them, we can go through a different targeting capability: lookalike targeting. Lookalike audiences (or similar audiences) are targeting lists that are created by Twitter using lookalike modeling that’s based on your tailored audiences list. Twitter uses a proprietary algorithm that considers similarities with the modeled users such as interests, engagement patterns, user locations, demographics and more to expand your reach to new users who share similar interested and attributes as your tailored audience. How To Use Lookalike Targeting? 1. Expand your reach by targeting similar audiences: You can create a regular remarketing campaign using one of your tailored audiences and simply expand the reach by also targeting similar audiences. This is done by clicking on the checkbox option, as shown below. 2. Target similar audiences only: You can also exclusively target similar audiences. To do this, simply follow the same process as above, but with one additional step: you need to also limit targeting by excluding tailored audiences when creating a campaign. The tailored audience list that you are excluding would be the same audience that you used to generate the lookalikes. Both ways of creating similar audiences can work quite well, however, we strongly recommend to separate your tailored audiences from your lookalike audiences. This will give you the ability to implement tests between current users vs. similar users and is a great way to get more insights and optimize based on their individual performance. Your Twitter campaign structure will heavily influence the overall performance of your campaign and a stellar structure can make all the difference, so be sure to set yourself up for success. What are some of the strategies that you use when building out a Twitter campaign? Please let us know. If you have any other comments or questions, feel free to connect with us. We are here to help!